The Lakota word, WoLakota, implies balance and coming together. The WoLakota project will support students in rural, high-need schools, pairing trained mentor-teachers with new teachers and providing Courage to Teach circles to tend to the “hearts” of each. Mentors will support the embedding of the Oceti Sakowin Essential Understandings (OSEU) into practice, complementing the Common Core State Standards (CCSS). The OSEU will address the achievement gap of American Indian students by embracing their identity, and will promote cultural understanding among non-native students and teachers. Lakota Elder Dottie LeBeau states, “When we approach teaching with one worldview…we create systems of failure in our schools.” WoLakota will close the circle into a system of understanding and success. 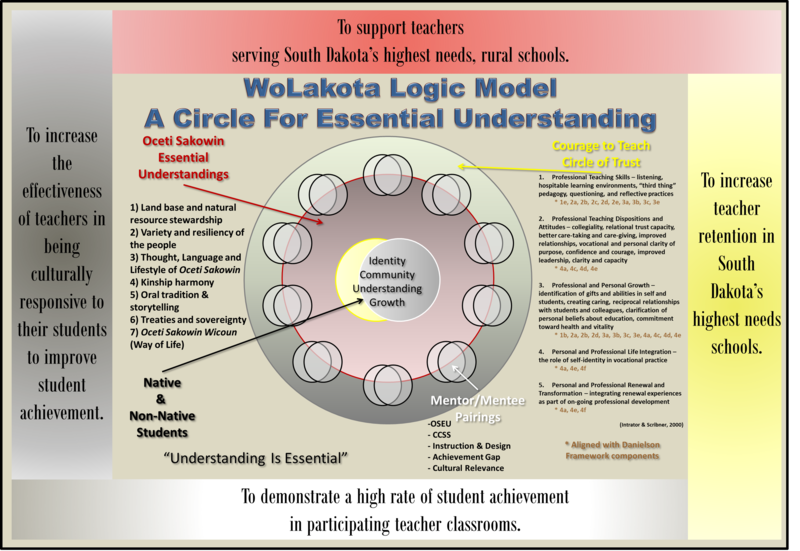 The goal of the WoLakota Project is to improve Native American student achievement by increasing teacher retention in South Dakota’s rural and high needs schools, and by increasing cultural congruity through the infusion of the Oceti Sakowin Essential Understandings. The WoLakota Project will 1) support teachers serving South Dakota’s highest needs, rural schools, 2) increase the cultural understanding between Native and non-Native teachers and students; and 3) increase the Overall School Performance Index ratings (doe.sd.gov) of the schools that are part of the WoLakota Project. The WoLakota project will impact 32,400 k-12 students by establishing culturally congruent learning practices via 240 mentor/mentee teachers, both native and non-native. All participating districts represent rural, high-needs schools with high native populations. All learners will be engaged in collaboratively accomplishing the plan of action that follows the graphic above. Teachers will learn about “Circles of Understanding” through first-hand experiences as well as through the guidance of trained mentors. The CTT seasonal retreats will allow all of the participating teachers to experience the value and gift of this sacred space in an authentic way. Teachers will explore themselves as educators and as human beings through the reflective process that is central to the Courage circle. Through this first-hand experience, as well as the mentoring, teachers will develop their understanding of the value of the Courage environment for learning. They will learn how to create this space within their own classrooms. Teachers will be given opportunities to explore the OSEU through a series of elder interview videos that explain the background and importance of the OSEU and through the curriculum resources which have been created. Teachers will begin to understand the importance of teaching about the Lakota/Dakota/Nakota culture and language with both Native and non-Native students. The resources that will continue to be created are a vital part of teachers gaining the background needed in order to create authentic learning experiences for their students. The OSEU is not about another content area to be taught, but about infusing cultural and language information into what is currently being taught within the CCSS. Mentors will guide the mentee teachers in finding the entry points for Lakota/Dakota/Nakota culture and language to be integrated into their curriculum and classroom environment. The goal is for the culture and language of the OSEU to become a part of the daily learning and experiences of k-12 students. Teachers will be given access to exemplar lessons and units as well as video resources to use with their k-12 students. As teachers become familiar with how to engage with the OSEU through these initial lessons, the expectation is that they will share what they are learning and creating with the other teachers within the program as well as with future educators. This process will help to sustain the program. The video and curricular resources are vital to the success of the WoLakota Project overall. The mentors have already created curricular resources during their OSEU for Educators course. They will use their experiences to help the mentee teachers see how best to choose their entry points for infusing the OSEU. All project goals are based on creating rich, authentic learning experiences for students as well as teachers. The WoLakota Learning Model process allows students to engage with content in a way that is intrinsically motivating and about students and teachers as Beings rather than doings. They experience this process in the safe environment created by the teacher. The goal is that students will learn to see any content in this same way, to be able to engage with learning in authentic ways. As this process becomes an integral part of students, each can make application in real world situations. Bringing these experiences to others, students will build understanding, drawing peers together rather than focusing on differences that divide.